A freewheeling conversation with the legendary Roc-A-Fella co-founder. 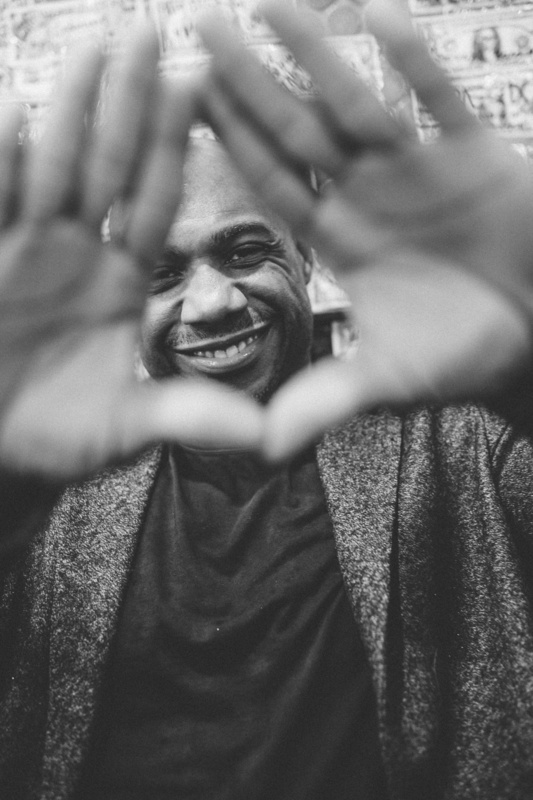 You may not know Kareem "Biggs" Burke's face, but you certainly know his hustle. The Harlem native has touched hip-hop culture for decades, having co-founded Roc-A-Fella records with JAY-Z and Dame Dash and headed up much of the company's historic deal-making. And he did it all while remaining impressively low-key, in an era before Instagram tags and viral tweets. After serving time on weed-related charges, Biggs emerged in 2016 with a slightly higher profile, speaking publicly about ventures such as his 2017 Air Force 1 collaboration with Nike. 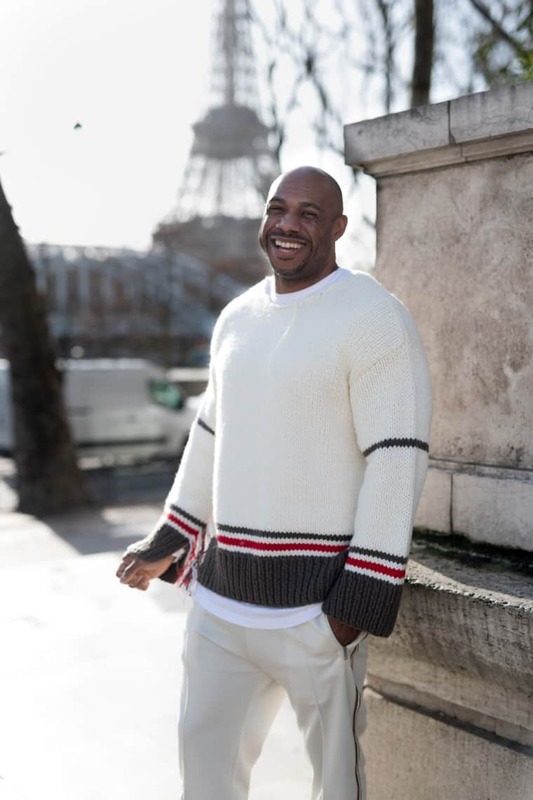 This year, he'll continue his work in the world of fashion, with the ReDo96 collection, and in 2019, he intends to release an official Roc-A-Fella documentary based on archival footage he recently discovered. On a wintery New York afternoon, I spoke to Biggs about learning from long-past mistakes, finding God, and the value of nostalgia. 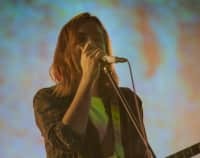 You gave an interview a couple of years ago where you were talking about the “Sunshine” video, and you were like, "We look back and laugh because we all make mistakes." What are the biggest mistakes you’ve made? That is a great question. I think there is probably several mistakes: the mismanagement of money, which happens a lot when you start receiving huge checks; a lack of patience in business; mistreating some people and relationships. I'm sure that we could have done a lot better with that because it was always an us-against-somebody-else mentality instead of compromise and trying to find a happy medium to get past things. Also when we were partners with Lyor [Cohen] at Universal and he didn't want to sign Kanye or the Young Gunz, and we had a chance to take them somewhere else and just sign them direct. That was probably one mistake because Kanye would have probably still been signed to us today if we would have done that. Looking back, do you have the perspective that things happen the way they're supposed to? I wouldn't say that they happen the way they were supposed to. There's a lot of things that people do that's straight-up wrong, and I don't think that's supposed to happen. I think we make our own choices, but the important thing is to learn from them. I think the good part of some of the mistakes are lessons that I could look back on and see what we did wrong, and be empathetic in putting myself in other people's [shoes]. At that time that wasn't really happening. We didn't really care about how people felt or what they thought. I think we take a step back and we look at things a lot differently, now. Empathy is one of the most important human qualities that we as a society lack the most. There has been so much conversation in the media about the different ways women are mistreated. Do you think it's possible to actually ever right those sorts of wrongs? Because I'm a Christian, I think righting those wrongs starts with prayer and asking forgiveness from God. But at the same time, from a male standpoint, you could go and apologize, genuinely and sincerely. A lot of times this has been coming up because something's happening in the workplace, right? Now, you felt like the rug is pulled from under you. You want to kind of revisit that, but I'm sure that there is things that's been done that you don't have to wait until some extenuating circumstance — you losing a job or something happened or you're being ridiculed in public — to reach out and apologize if there's something that you feel that a wrong that you want to right. Some people say the best apology is a check. Well, I don't know who “some” is. I’m not being sneaky, it’s just to mean that words only do so much and structural changes are needed. Mistreatment of women doesn't just happen in Hollywood. It happens at the Post Office. It happens at the grocery, wherever human beings exist and there's an imbalance of power. Yeah. We're talking about maybe a few people that's been in the public eye, but what about the ones that aren’t [rich or famous]? You mentioned being a Christian. Can you tell me a little bit about how your spirituality fits into your life? It's a daily struggle. Being a Christian doesn't mean that you don't do any wrong. It's about praying and asking forgiveness and asking for wisdom to make the right choices. I'm trying every day to walk a better path, but I'm a fallible human being and I make mistakes. As far as Christianity is concerned, the important thing is that I recognize that Jesus is the Son of God and the only way to God is through Him, through the Son. Did you grow up believing? No. I actually didn't. My mother was a Christian. She's not here anymore, and as I look back at it, I learned Christian values from her because she displayed it without preaching it. But actually believing in Christ and giving my life to the Lord, that happened a few years ago. With all of the wisdom that you've gained, how do you share those sorts of experiences with young people or people who may be in need of guidance? I'm a part of a group called the New Canaan Society and we have a nonprofit, NCS Inside. I've been to maybe 15 chapters. There's about 60 around the country, I've spoke to kids there as well. Also, Harlem Village Academy, which used to be Rice High School where I actually graduated from in Harlem. I was a part of that as well, speaking to kids there. Yeah and, also, the National New Canaan Society that meets in D.C. I was the keynote speaker there two years in a row. What's it like for you to be in Harlem now, in the Harlem of today? It's a great thing. Harlem a really huge part of my life. It's memories. It's good and bad, but as I ride through the streets and look around, there is just so many stories and good times. It's almost every few blocks I can remember something happening where I was doing something that was probably life-changing or something that sculpted me as I became a man, learning the hard knock life. 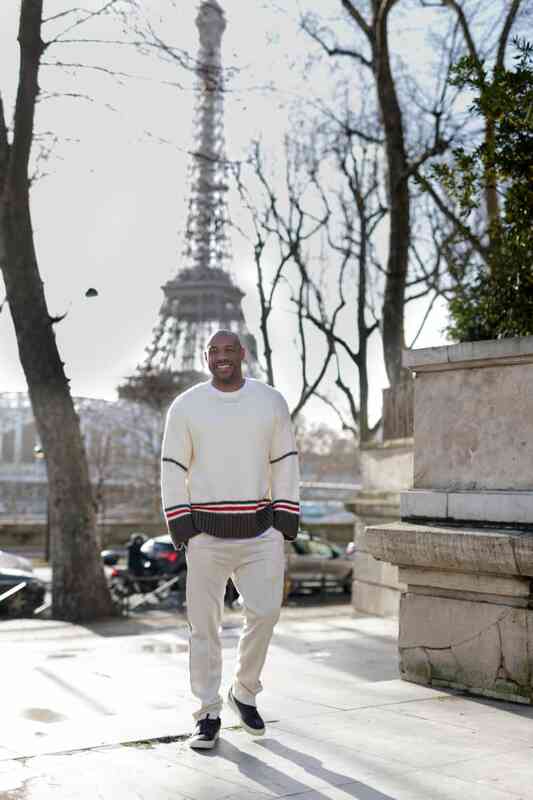 That's why when I launched the Nike sneaker, that was the first place that I wanted to make sure that we visited — the actual block that was home base for us, and that the bus stop, the crew that I was a part of that we would meet at all the time. That was really important to me. The first thing that I did was in House of Hoops on 125th Street, so I wanted to stay true to that and, also, even the photos. I took pictures at the project that I grew up in, and went around to show people. It's always important for me when I'm doing something, whether it's clothes, sneakers or whatever it is to kind of tell a story to bring people into whatever it is that I'm trying to deliver. Yeah, like grounding yourself in your own history. Where do you stand on the very controversial issue of gentrification? I don't think gentrification is a bad thing. The thing about it is that people that's living in those communities, how do you keep them a part of the community? How do you make them a part of it with educating them or showing them how to open businesses and be a part of what's changing? A lot of times [gentrification] is rent hikes, buildings changing, and people getting shoved out of those neighborhoods. If it's a way to be all-inclusive and to make sure that the people, that's been a part of those communities for years still stay around but, at the same time, have access to resources, then it'll be a lot better. Speaking of which, what has it meant to you to watch Dapper Dan’s career, through the ups and downs? It’s one of those great stories. For me, it means something different because I remember being little and walking down that street and wanting to even go in the shop, seeing the people that hung around that shop, and seeing all the clothes and stuff. I mean, I didn't have money to get any of it, but it was all aspirational. When you see things like that, it helps you and it gives you drive to want to be where he is and have that level of success. To have the notoriety, to have the skillset that he had, and for all this time to not be recognized, and then to come around and be recognized for the greatness that he's created… I think that’s a story and a lesson. Something that I’ve felt watching this unfold over the past little while is a real admiration for how gracious he's been throughout the whole thing. I feel like it would have been really easy for a person to be bitter about the back-and-forth with Gucci. Yeah. He's a humble soul and that's something that I try to model myself after. When you become successful, it’s easy to remove yourself and not go back and revisit those issues, but once you feel like you're grown enough or wise enough to get over those situations, and show that you can move on past it, I think that helps the next generation. It removes that one layer of anger and it helps you peel back the onion, and then you get to the core of whatever it is. It’s like, "Look. Mistakes happen, but this is where we're at now." Keep fighting. Keep pushing through. Just persevere and anything could happen. I've heard you mention multiple times that you were interested in putting together some sort of Roc-A-Fella documentary. What has your archiving process been like? Do you have access to much? Well, I actually have a lot of stuff. I'm probably the only one that does. Actually, it just got shipped to New York: VHS tapes, DVDs, unreleased music, Kanye's first performances, first interactions with Kanye in the studio, things with Jay, the whole Roc-A-Fella on tour, private jets. There's a lot of behind the scenes, even the prequel to Roc-A-Fella. I have, probably, five, six hours of footage that happened leading up to Roc-A-Fella, with Jay performing and us on the road and really trying to build the name. Jay performing in front of 10 people or 20 people, to 500 people, to college shows. During that time, that's when that logo was being etched on our hearts. I haven't digitized everything, yet. Right now, I'm just talking to people. It's not one person that I spoke about it that doesn't want to do it, so now it's really about pick and choosing who I'm going to partner with to really tell the story of who we are: these Black men, who started out as kids, who came together to build something that I believe changed the world. It's nuts to think about because, to some extent, the normalization of smartphones and all this digital technology is rewriting history a bit. Like, talking about how accessible it all is now can make us forget the extent of documentation there was before. Yeah, exactly. Maybe you couldn't record on your phone, but that's when you had that big camcorder on your shoulder with a big VHS tape. Probably 20-30 pounds where you had to be in good shape to be walking around with that thing. And it cost a little bit, so if you were taping something, you knew it was good. Yeah. You can look at the filters now that they have, like on Instagram. Even though we're in a digital era, analog is cool now because everything is digital. When I put this together, because it's going to be from my point of view, it's going to be something that's creatively different and it's going to be innovative. I'm hoping to change the way documentaries are made. On the topic of nostalgia, nowadays there's a huge generational divide that's amped up by the media. The press loves to harp on, "Such-and-such 18-year-old says Tupac is boring" or “So-and-so says they’ve never heard a Biggie song.” Do you think that matters? First of all, I think it’s over-exaggerated. But it's a new generation. You can't fault them for saying, "I never heard this." You know, like if we go to somebody and they ask us, "Have you heard of the Stylistics or the Delfonics?" And we say, "No. We've never heard about it.” What does that mean?" There's a new age of music, new preferences. There's a new wave of things happening and that's the great thing about hip-hop. It always evolves and changes. When [Roc-A-Fella] came in, the reason why I believe we were so successful in the beginning is because it was a new sound, a new way of talking, a new way of telling stories. That lifestyle and movement brought kids in, but it was generations before that who probably didn't like what we were doing, you know? It’s like how a lot of stations that were oldies stations are now playing golden-era hip-hop. Yeah. I got Jay-Z on my playlist, I also have A Boogie on my playlist. I have Kanye and I also have Gunna. You’re not really interested in working with new artists anymore, right? Is it fair to say your passion is fashion? No. I wouldn't say my passion is fashion. My passion is business, so fashion is just one thing that I'm doing, a part of several other businesses that I do plan to release to the public as these deals get signed. I think that people will start to see my chess moves now because I usually do one thing, which is probably five moves ahead, to open the doors for something else. Fashion is just in the forefront right now, but I love business overall. I like creating something from nothing. You guys broke a lot of barriers. What do you think the next version of that is, when you look at things like streaming and these other new territories? I think that the barriers are still being broken. I'm self-funded. I'm still doing things with an independent spirit. That's what we started out with and I would say the present example of that — standing out from other streaming services with hi-def quality, original content, exclusive releases — is TIDAL. I think that Jay is still breaking down barriers right now with TIDAL. Yeah. I mean, especially when you think about the Prince situation. That was a huge moment for the general public to understand the importance of ownership. Yeah. It was. I was in the background cheering as well once he was able to release that on TIDAL. The thing about Jay is he is all for the culture. He is all for empowerment. He's all-inclusive, but right now he's trying to really push black excellence and show our community that we can do so much more. Even with Puff, right? Diddy's talking about it every day. The tone has changed. The way people are talking has changed. Everybody had been looking at everything as competition. Now it's like, "How can we work together?" So I think showing that camaraderie is going to show people that they should be working together, too, and thinking about building things and having an ecosystem of a network. A lot of times you put the transaction in front of a relationship and that's what takes the real relationship away. You start to keep a scorecard and say, "I did this for you. You owe me one.” But when it's relational, that means you're really doing it from the heart and that's all love. Do you agree with Jay and Puff’s ethos — loosely speaking, not to be reductive — that wealth will bring us closer to freedom? I don't think that's the only thing that they're talking about. I think it’s not wealth, but being educated and knowing how to manage your money is one part of it. So it's not about having it. It's about keeping it. Tax codes, and housing situations, and a lot of times when there is new money and people are making it, and it's coming so fast they don't think that faucet is ever going to turn off, and then once that faucet is just turned off out of nowhere it's like, "Oh, man. What do I do? I didn't do anything outside of this." Whether they're in music or sports, they didn't think about other businesses or investments. I think that's what [Jay and Puff] are preaching: how to build businesses, how to think about generational wealth, like leaving things for your kids.